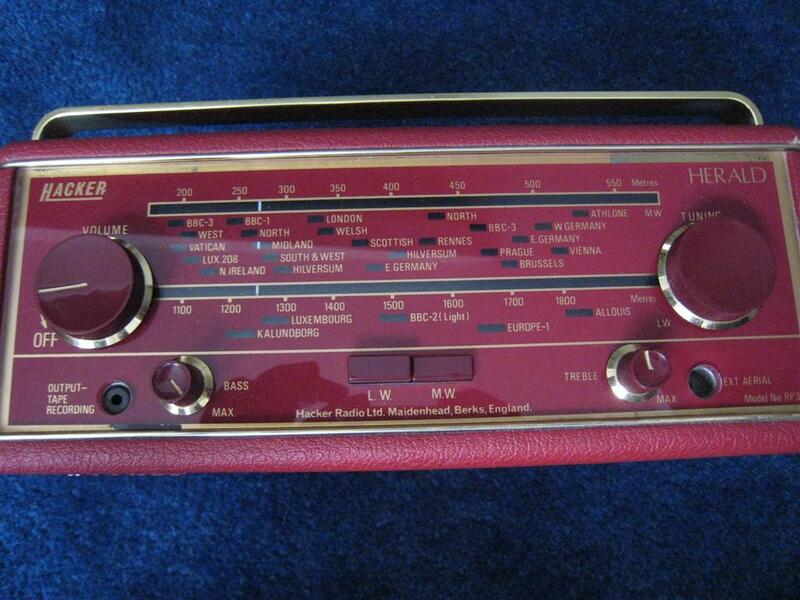 About a month ago a friend of mine from a small but active radio chat group announced he had purchased a “mystery radio” from the UK and that this might be something of interest. 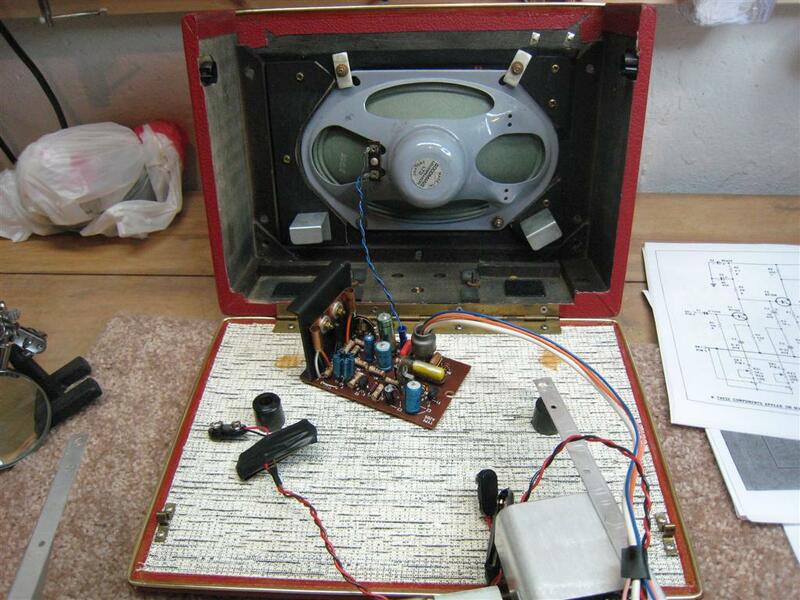 That radio turned out to be a Hacker RP25 Sovereign. Wait a second…a what did you say? A Hacker? No, this has nothing to do with those miscreants who try to break into our computer systems…Hacker is the name of a UK-based company that I had never heard of before which came as something of a surprise because I thought I knew all the big names in radio manufacturing. Evidently I am not alone. Hackers were never exported out of the UK so even though they enjoy a following there, they are relatively unknown to the rest of the world. to learn what I could about these radios. I highly recommend this group if you are interested in knowing everything “Hacker” there is to know…their files are replete with documentation including most of the service manuals and information about the company and the various models. You can also go to http://www.radiomuseum.org/ , type in Hacker and see pictures of many models there. Hacker enthusiasts are very proud of the quality of these sets …quality was a company mantra…in the tube era Hacker and it’s forebear Dynatron (also operated by the Hacker family) were technically superior designs, with some models sporting 17 tubes while the competition was trying to reduce tube count. The transistor sets…at least most of them with the exception of the very latest models, are built tough, are easy to disassemble for service and have a unique design I find appealing. Many of the better models feature huge 10” ferrite rod AM antennas and 5 x 8” elliptical speakers for strong reception and powerful audio. They are not without their quirks however. One biggie…there are no Hacker radios with the exception of some early tube sets, that cover the full FM band here in the US…most Hackers, including all the transistor models, top out at 101 or 104 MHz. Too bad they had not been designed for world-wide distribution because this one limitation may be a game-ender for many radio enthusiasts. For me this meant I would at least initially limit my search to a primarily AM model. Another potential complication is that many of the earlier models run on two large PP9 9 Volt batteries to supply 18 volts for the set. These batteries, still readily available in the UK, are not available easily or cheaply here in the US. Luckily my seller offered to make up adapters to run the radio on 12) AA batteries and since it will run for at least 100 hours on a set that is not too bad from a cost perspective. Germanium transistors. Here is where a bit of research in the files section of the Hacker group will pay off…some of the early sets used Germaniums which are failure prone. Yes they can sometimes be revived but if you chose your model carefully you can chose a model produced after the conversion to silicon transistors and eliminate one potential problem area. The RP35 model I chose was made with both but the change occurred after serial number 20,000 so I checked the serial number prior to purchase. After a while you will learn where certain frequencies fall. I chose a Herald RP35…a MW/LW only set. Purchased through a member of the Hacker group I had confidence I would get a good deal. The set was not bought as restored, merely as working so I expected to do a few things to it before I could truly evaluate its performance. 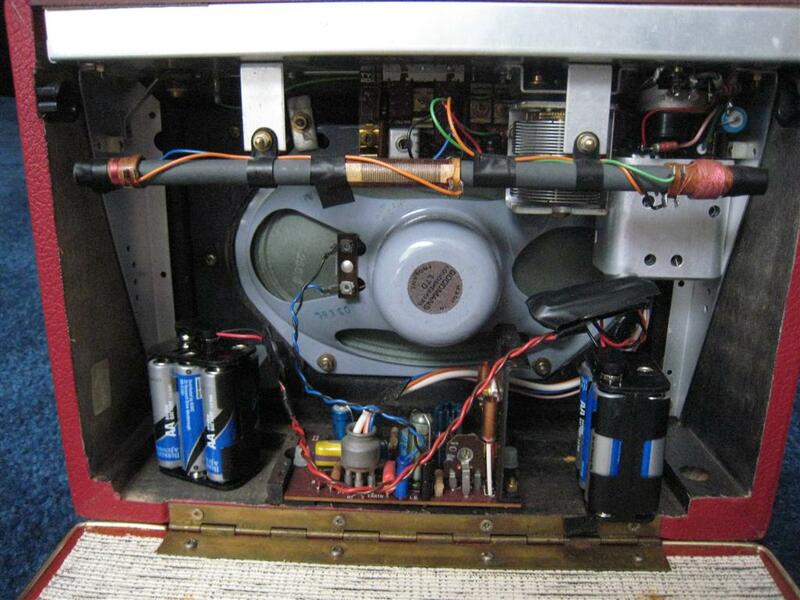 Out Of The Box: As received my Hacker had a few issues…all fairly typical of old radios. The sound was a bit thin and the bass control seemed to have no effect. Where was the big “Hacker Sound” I was expecting? The tuning needle seemed to be dragging mechanically…as I tuned up and down the band it would bend to a diagonal position, then slip free and straighten out again. Reception was not bad but when I tuned all the way to the top of the band I was only tuned to about 1530 while it should reach up well over 1600KHZ. RF/IF Unit Is removed With Only 4 Screws! 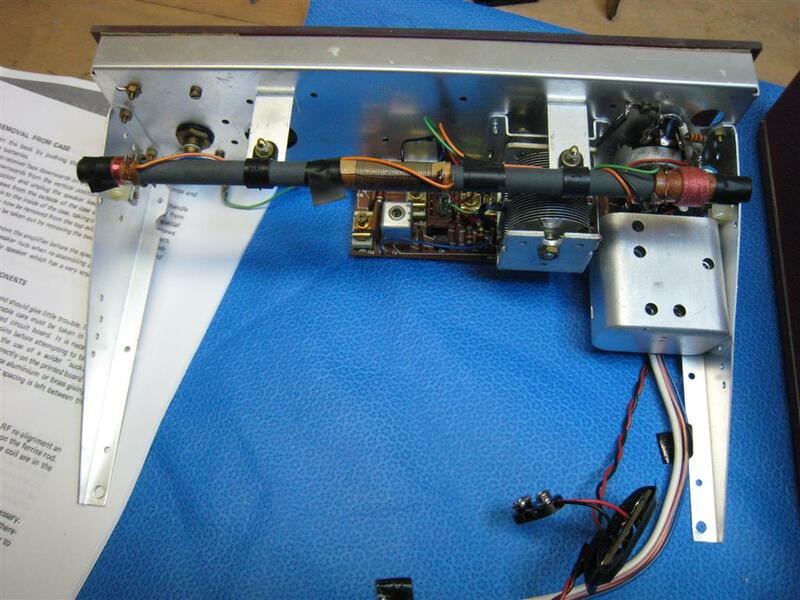 Repairs & Adjustments: The good news is that this radio is extremely well made and very easy to disassemble and work on. Simply remove the handle by snapping it downward, remove its two mounting screws, and two more screws securing the bottom of the metal chassis. Pull out a five-pin plug running from the top of the chassis down to the audio amp board on the floor of the cabinet and lift the chassis up and out. To remove the audio amp board, unplug two speaker leads, remove two plastic nuts and out it comes…it just couldn’t be simpler. 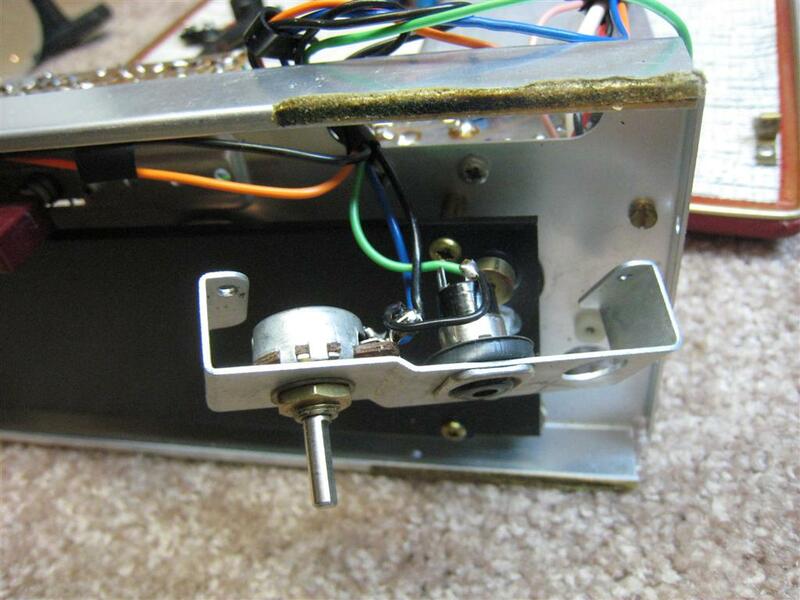 You can also remove the dial glass if you need to by removing 4 screws hidden beneath the volume and tuning knobs. The sticking dial was caused by a bent mount for the dial glass…straightening that out and cleaning where the needle slides resolved that issue. 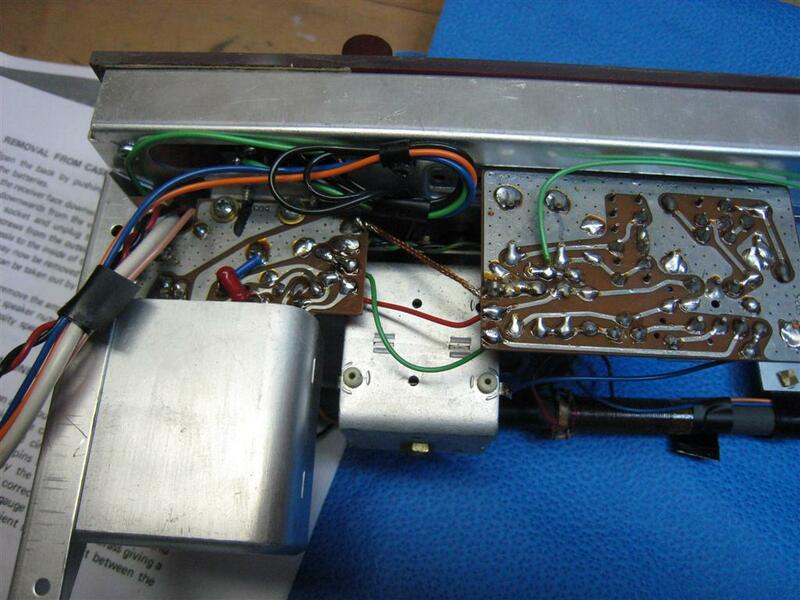 The bass control was a bigger problem…it turned out that the control pot itself was bad…a fairly uncommon thing. Again access was easy. 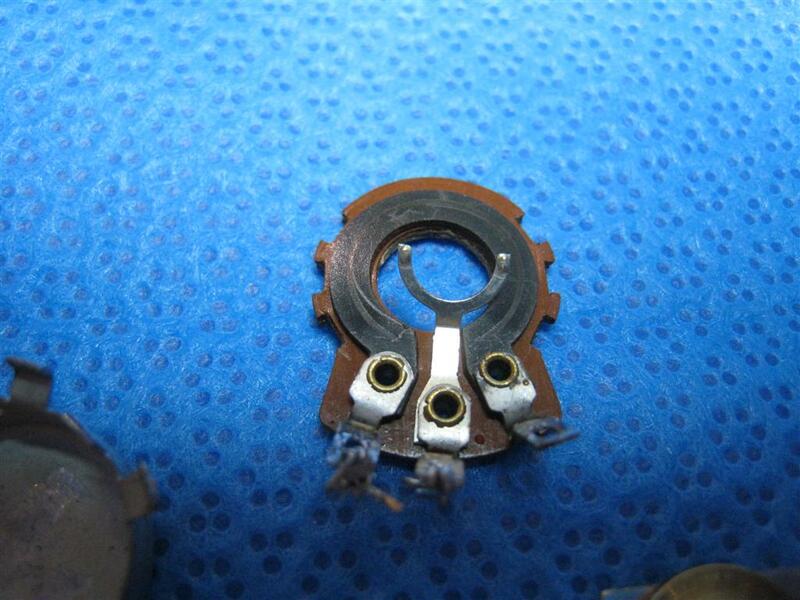 Two more screws were removed to loosen a metal plate the control is mounted on. 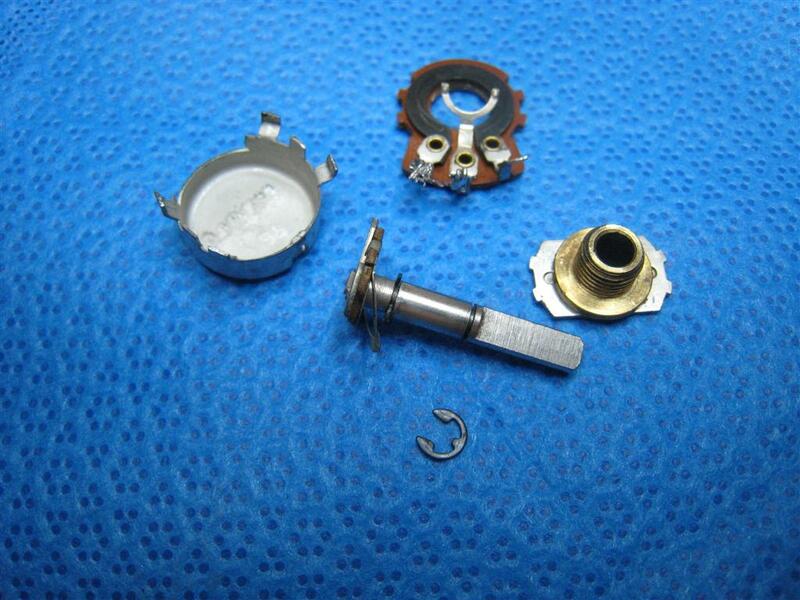 I disassembled the pot and was able to repair it…the fork-like contact you see in the picture was loose and had moved out of its center position off to the right…I tightened its mounting lug and that restored normal operation. A few of the electrolytics measured slightly deteriorated on my ESR meter so I replaced them but in this case there was no noticeable difference in performance. Still, if you have an ESR meter, it’s good to replace out of spec electrolytics…sometimes it makes a huge difference and of course, if they’ve deteriorated already, they may get worse with time. On the other hand I do not replace electrolytics that still measure good…if they’ve lasted 40-50 years already they are likely to last a good while longer. Alignment was mostly straight-forward…but be aware that several Hacker models, including the RP35 use an unusual 470 KHz IF frequency. The manual warns against attempting to adjust the IF’s unless you use a sweep/marker generator and scope and this is probably good advice. They warn that simple peaking of the IF frequency might result in excessive gain and instability and using the sweep gen and scope ensures a symmetrical IF bandpass. One experienced Hacker restorer told me he’s never touched an IF in one of these because they don’t seem to drift much. Of course I wanted to be sure my RP35 was operating at peak RF efficiency so I tried a safe experiment. I tuned to a faint signal and carefully tried each of the IF adjustment cores, reasoning that if I was careful and if something bad happened (such as if the radio broke into oscillation) I could return each adjustment back to where it had been. The first two I adjusted were already at absolute peak so I left them as they were. The last one produced a very slight increase in signal strength with a slight rotation so I left it at that peak. There have been no ill effects but if there were I made a note of which core it was and how I adjusted it. I used a weak radio signal for this rather than my signal generator as I normally would specifically so the radio would be in actual receiving condition letting me hear exactly how the reception would be affected and hopefully lessening the effect of trying to peak the IFs exactly at 470 KHz. The rest of the alignment was easy and uneventful…when done the radio easily spanned from about 530 to 1630 KHz and I spot checked every marking along the scale and it was right on…perfect dial tracking. I also calibrated the LW which was off similarly to the way the AM had been and was gratified to see that it also aligned perfectly. In Use Tests: RF Perforamnce: As there is little other than overseas DX and beacons available on longwave here in the US I consider this to be an AM only portable and in that context it competes very well with my other vintage AM only sets. Although the RP35 lacks a tuned RF stage the sensitivity is nevertheless quite high due at least in part to that large 10” ferrite rod…the biggest in any radio I own. The Hacker has a rather subtle AGC effect compared to most modern radios which means weaker signals are received at a lower volume than stronger ones, so at first it may appear the set is not as sensitive as it really is. But if you turn the volume up to compensate (and there is plenty of reserve audio power available) you will find that the actual reception is quite excellent…far better than most and just a very small hair below my reference radios. Selectivity is very good but is probably a bigger limiting factor than sensitivity on the RP35…some signals which are adjacent to stronger ones seem to fade more into the background than they do on other radios and this seems to be caused by desensitization when tuning near a stronger signal. The RP35 also features a unique built-in swivel base which makes it a breeze to aim the radio for best reception…and it adds a very deluxe feel as well. Generally speaking the overall reception on the RP35 is excellent. Most of my weak, out of town daytime signals which are noisy on lesser radios are loud and clear on the Hacker and most of them come almost as well as on my very best AM radios. The RP35 came in as a four star radio when I added to my AM Radio Mega-Shootout and that is excellent AM performance indeed. Sound Quality: I was told in advance that Hackers are known for fuller, richer audio than most of the competition and therefore to expect very good sound from this radio – I have not been disappointed. It is rated to deliver 1 ½ watts of output power which is a lot by today’s standards and coupled with the 5 x 8” speaker the sound is loud, clear and full. There are a few other Hacker models which include FM and are fitted with even better speakers than the one in the RP35…I have been told they sound even better, but for an AM only portable this RP35 sounds wonderful…it is very pleasurable to listen to. 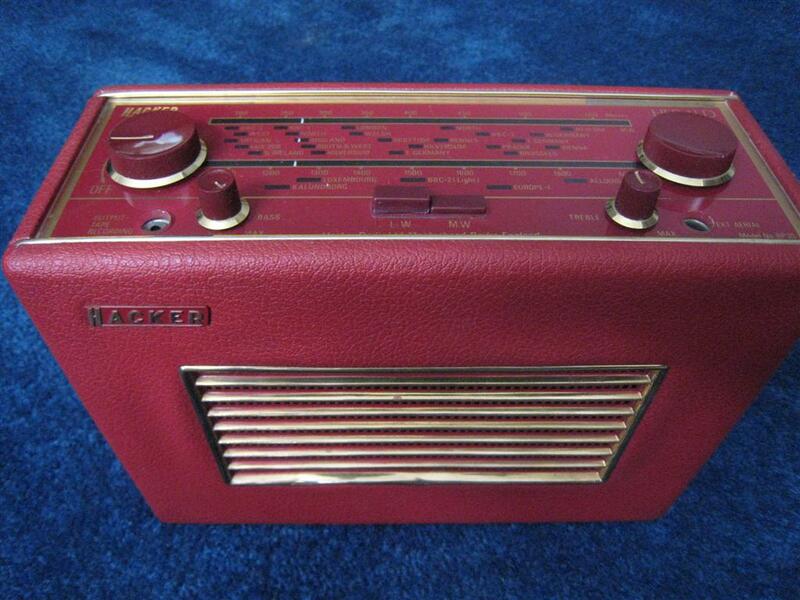 In fact I have only one radio which sounds better…the ITT 103. (Read The ITT 103 Review Here). Conclusion: Overall I find the Hacker Herald RP35 to be a joy to own with its retro European styling (available in several colors), rich AM audio and very good reception…certainly better than most of what passes for an AM radio today. The dial is beautiful with its markings showing stations long gone from the British radio landscape. I like it for its nostalgic value, it’s obvious mechanical quality, solid feel and great audio. It won’t be for everyone, and I truly wish there were an FM Hacker that could tune to 108 MHz but as they say, the perfect radio has yet to be built. Nevertheless I think this is one of the better ones. Highly recommended.